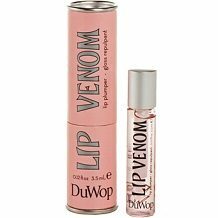 Today we review what DuWop says was the very first lip plumper on the market, Lip Venom. The name is slightly misleading though because while DoWop wants to give you that bee-stung effect, it does not use bee venom. Instead, essential oils which cause blood to rush to the surface of the skin are used. This is, therefore, a circulation-based formula. The good thing about essential oils is that they penetrate deeply into the skin, delivering a host of healing, soothing and rejuvenating properties. The first three oils are circulation enhancers. They cause blood vessels to dilate and blood to rush to the surface of the lips, making them look flushed and voluminous. Jojoba and Avocado are more nourishing and anti-aging than anything else, so they keep your pout hydrated and clear of dry skin. It is likely that the Wintergreen contains a clinically proven ingredient or a derivative thereof in the form of peppermint oil. That said, a host of other well-researched ingredients that have also been clinically proven to achieve better, more long-lasting results, are missing. These include vitamins C and E although admittedly, you are likely to derive some of those benefits via the oils. But the fact remains that this still leaves the formula without wheat extracts, amino acids, Willow Herb Flower and Pink Purslane. A 0.12oz wand of glass costs $16 when you purchase it online from the product website. There are no discounts. Use the wand to apply the gloss to your lips. For extra definition, apply lip venom to your lip line. You can use a neutral lip liner to do so if you prefer. Despite doing extensive research, we could not find any evidence of a guarantee or returns policy. DuWop does not test their products on animals and is free from a host of harmful, synthetic compounds. It is one of the only formulas based on the working of a blend of essential oils, making its methodology different. It is also impressive to note that while the product does not get the very best reviews, it nonetheless gets above-average consumer feedback and ratings that surpass that of limp plumpers priced higher than $120 each. That said, the formula works by increasing circulation, not moisture, which is critical to a long-term plump. It does not, for example, seem to stimulate Hyaluronic acid, which hydrates and retains moisture better than almost any other compound. There are no patents in this formula, so you can’t be guaranteed of ingredients that are more hard-working and produce innovative results that can be backed up by data obtained from independent clinical trials. Efficacy rests on a minimum of five patented ingredients, so this lip plumper falls short of that criterion. We also could find no GMP certification.